Weddings in DC don't always have to be an elaborate affair. An elopement at the H. Carl Moultrie Courthouse or the DC War Memorial is a popular and elegant alternative if you want to your nuptuals simple. The money you save can be invested in other things, such as some fine art wedding day portraits at historic and iconic Washington DC locations, followed by a lowkey dinner with your closest friends and family at one of the District's best restaurants such as Rose's Luxury or Central by Michel Richard. When looking for a photographer to capture your elopement, be sure that they know their way around the downtown area so they can capture those obvious and well known places as long as those hidden gems along the way. DC architechture has a lot to offer, from the clean lines of the National Gallery of Art's east wing or more dramatic neoclassical facade of the west wing. An elopement leaves more time for the photos you want and a relaxed feeling to your day. No need to rush if you make some reservations later in the day to celebrate with your loved ones. You could also keep it a secret affair. After your short ceremony and wedding day portraits, make reservations at Fiola Mare in Georgetown or wait in line at Bad Saint in your wedding attire. No matter what, an elopement is a way to keep your nuptuals casual and free from the stress a traditional wedding can bring. Give us a call at 410-903-7590. 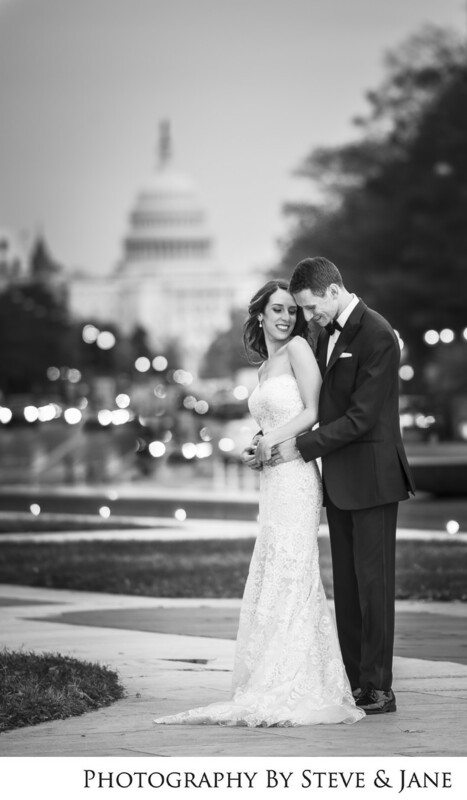 We'd love to capture your DC elopement! Location: 1321 Pennsylvania Ave NW, Washington, DC 20004.